natural products are always a big hit! Like us on Facebook for a chance to win a gift box in our drawings! 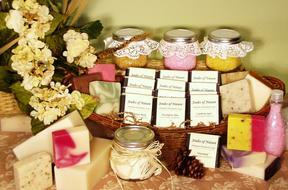 Body products to sooth the soul that can be made to order. No size is too big or small. Our experienced designers can sit down with you to plan out what you need. As a family-owned and operated business, we take delicate and individual care of every single arrangement and customer! Email us today for your perfect gift!